If you have lost some or all of your natural teeth, dentures are great tools that can help you get your perfect smile back. But, like any other tool, even dentures need maintenance to work well and look good. When it comes to patients who wear dentures, many of them don’t know how to properly take care of them. This article will help you get acquainted with everything you need to know about caring for your dentures. Even though dentures have artificial teeth, they need to be cleaned regularly. Just like your natural teeth, dentures suffer from plaque, tartar, and bacteria build-up, which is harmful to your gums and natural teeth. Food particles tend to get stuck in dentures. Since these particles are a breeding ground for mouth bacteria, they must be removed. To rinse, simply take out your dentures and run water over them to dislodge stuck food. Keep in mind that dentures are expensive and very delicate and hence, place a towel on the sink to avoid damage due to an accidental slip. You will need a separate brush for cleaning your dentures and natural teeth. 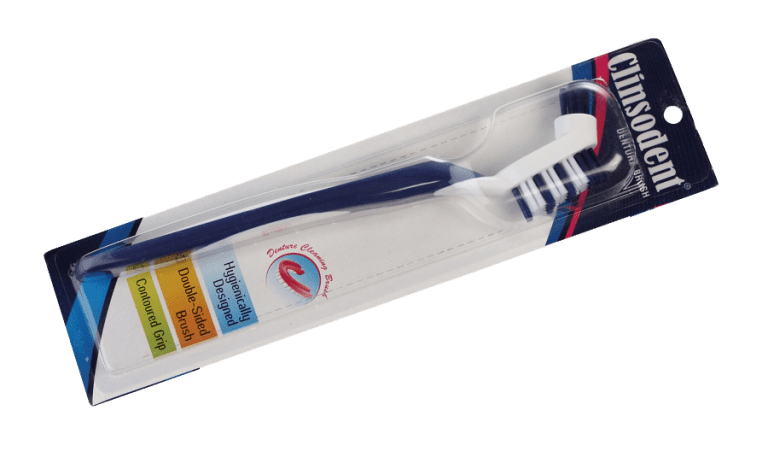 Since bacteria and plaque have more space to build up in a denture, you can use a specialized product like Clinsodent Brush which is designed for cleaning dentures. It has two types of nylon bristles to clean all surfaces and grooves. Remember, while brushing you should be gentle enough to avoid creating dents but methodical enough to remove all bacteria. Just because you wear dentures, it doesn’t mean that you can ignore oral hygiene. Once you remove your dentures, follow your regular dental care regime. 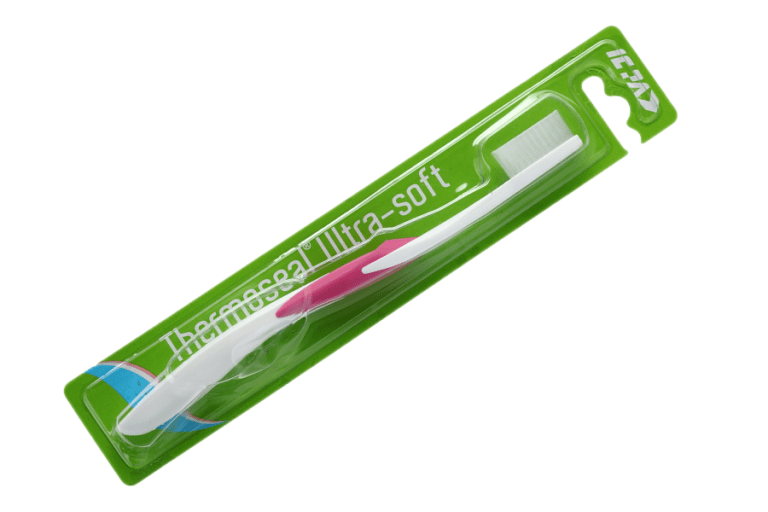 Use a toothbrush with soft bristles like Thermoseal Ultra-Soft Brush to clean your natural teeth, gums, and tongue twice a day. If you feel that your toothbrush is too rough for your gums, use a soft wet cloth wrapped around your finger to massage them instead. You should also pay special attention to cleaning teeth that fit under the metal clasps as plaque can get trapped here and result in tooth decay. You can also rinse your mouth with salt water to keep your gums clean. Cleaning your denture plays a major role in denture care but, there are some other instructions that you need to remember. Make sure that you don’t use your regular toothpaste, strong cleansers, or other abrasives to clean your dentures as they can damage them. 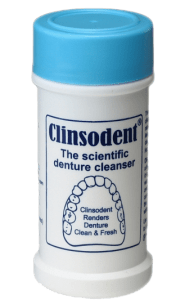 There are many denture cleaning products like Clinsodent Powder and Tablet that gently clean your dentures without causing harm. To avoid the hassle of buying individual products, you can use comprehensive products like Replay Kit that contains all the necessary tools for effective management. 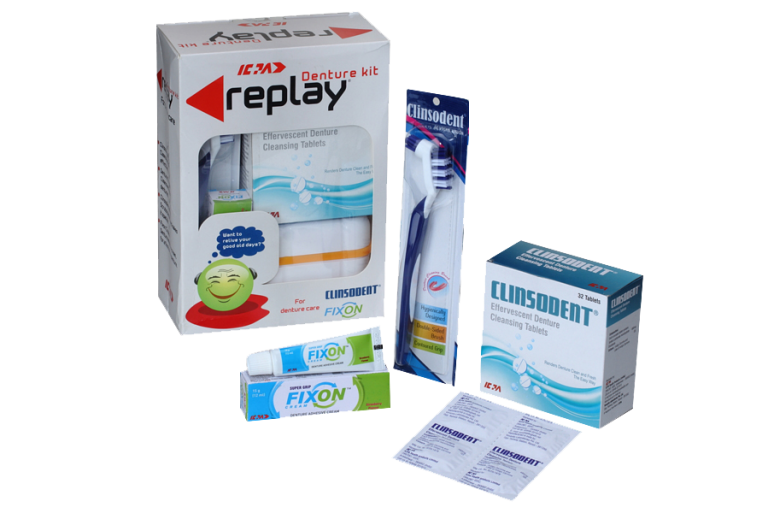 The Replay kit comes with Denture Storewell, a container for keeping dentures overnight, Clinsodent Tablets, Clinsodent Brush and Fixon Denture Adhesive Cream. However, not all denture cleaners are the same. Those who have sensitive teeth or gums are prescribed dentures with soft lining. Such dentures need special cleaners. Similarly, if you use metal dentures then you will need cleaners that are designed to clean metal. If you need help picking a cleaner, then you can always consult your dentist. Like your natural teeth, even dentures can get stains. However, teeth whitening products are harmful to your dentures as they weaken them and make them more prone to damage. To make sure that your dentures don’t look stained, reduce intake of beverages like coffee, tea, and red wine, that cause staining. In case your dentures have become too discoloured, you should consult your dentist for a professional denture cleaning. To avoid gum inflammation or yeast infections, you should always remove your dentures before you go to bed. Since wearing dentures is taxing on your gums, when you remove them at night, your mouth tissues can recover. But keep in mind, when your dentures aren’t in your mouth they should be soaked in water (at room temperature) or a suitable denture cleaner. If you let them dry out, it will cause them to warp or crack. Furthermore, soaking them overnight also helps in removing stains and plaque. If you’re using a denture cleaner, rinse and brush your dentures before putting them back in your mouth. The chemicals used in these solutions may cause vomiting or pain if swallowed. Your dentist is crucial for the maintenance of your dentures. Over time, it’s possible that due to change in the bone and gum structure or tartar build-up, the dentures will no longer fit properly. Ill-fitting dentures can cause irritation, painful oral sores, and burning. When you regularly visit a dentist, he or she can examine your denture and make the necessary adjustments when required. He may even prescribe denture adhesives like Fixon Super-grip, Cream or Powder or recommend a professional cleaning depending to your condition. The first step towards effective denture care begins with making a schedule and sticking to it. Good habits will go a long way in ensuring a pleasant denture use without any complications. Moreover, since dentures can make it difficult for you to bite and chew fruits and vegetables, it is vital that you take extra care to maintain a balanced diet. Felton D, et al. Evidence-based guidelines for the care and maintenance of complete dentures: A publication of the American College of Prosthodontists. Journal of the American Dental Association. 2011;142:1S. Carr AB (expert opinion). Mayo Clinic, Rochester, Minn. Oct. 22, 2014. Salinas TJ (expert opinion). Mayo Clinic, Rochester, Minn. Oct. 30, 2014. It’s interesting that you should schedule more regular dentist appointments with dentures. It makes sense that they’d require a more effective maintenance process so I’ll want to make sure to talk to my mom about it. She’ll be getting dentures soon and it’s important to me that she takes good care of them. I didn’t realize that teeth whitening products are actually harmful to dentures. This would be good for my mother-in-law to know since she was considering a bleaching product to make her dentures whiter. I’ll be sure to inform her that she ought to consult her dentist for a professional cleaning instead. I’m glad you said that people with sensitive gums can get soft denture relines. My mother has been putting off getting dentures because her gums are really sensitive. Maybe she should ask her dentist about getting some with a soft lining for comfort. I would really like to see more good posts like this! This blog gave me so much relief from the stress of denture care. Thanks for sharing. I wants to know some information on dentures for children.